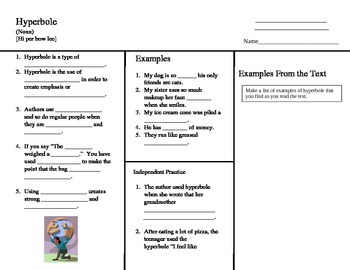 Use as a hands-on worksheet for the direct instruction or review of the academic vocabulary word "hyperbole." Students fill in the sheet during a mini lesson on hyperbole. It can be used for explicit direct instruction or review and reinforcement. The final column can be used with a guided or independent reading of the teacher's choice. In the 8th grade, The Clown by Patrick McManus or reflections on Dating by Dave Barry are good selections to use with this activity. This activity is appropriate for grades 6, 7, 8, 9, and 10. This is a great sheet for teaching this academic vocabulary word to ELL and ELD students. 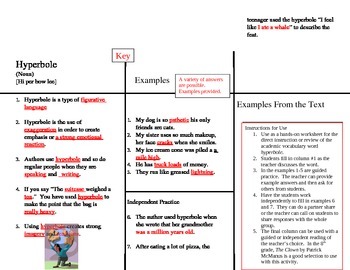 It was created by a teacher trained in SIOP strategies.